Available for indoor or outdoor wedding ceremonies, church services, cocktail hours, dinner parties and much, much more……………. 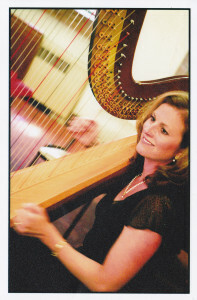 Harp Soloist and Ensembles in Southern New Jersey Including………………………..
Lucia Marone: With over 25 years of experience and her commitment to specializing in wedding music, Lucia is a South Jersey Wedding Harpist who enjoys an active career as a professional freelance harpist. She believes her clients are entitled to professionalism, punctuality, courtesy and above all, the ability to hear the music they are paying for. Her popularity in the wedding music community is attributed to the continuous referrals from previous brides, wedding consultants and established caterers. She has become the premier Jersey Shore Wedding Musician performing in Cape May, Stone Harbor, Avalon, Long Beach Island, Brigantine, Sea isle City, Ocean City, etc…..
Sarina Marone: Sarina began playing the harp at age 6 with her mother and continues to study in the Philadelphia Area with some of the top professional harpists in the world. 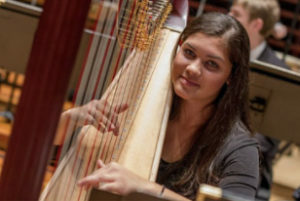 She won the junior harp division competition for the Philadelphia Harp Society in 2013. She performed with Rowan Youth Orchestra and is now a member of the Philadelphia Youth Orchestra. Sarina plays three nights per week at the Hotel Alcott in Cape May during the summer months and enjoys playing weddings on the side. Sarina also plays the first Friday of each month at Eastlyn Golf Course in Vineland, NJ. Now booking music for holiday parties in South Jersey. Outdoors Weddings Have you wondered what type of music will be used for your outdoor ceremony or cocktail hour? 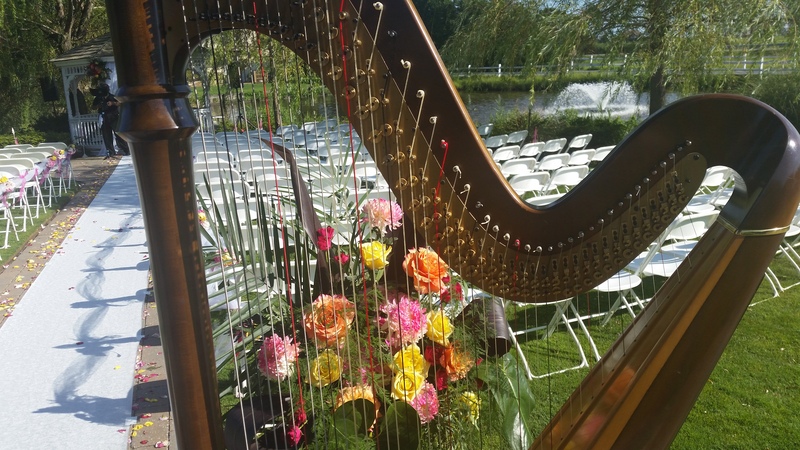 Well there is no need to worry, the harp is an elegant choice for your next outdoor event. Lucia prefers to use a pedal harp for outdoor events. This type of harp is able to meet the acoustic challenges presented by outdoor weddings. Wireless amplification is available for larger crowds. Amplification is also available for the officiant. 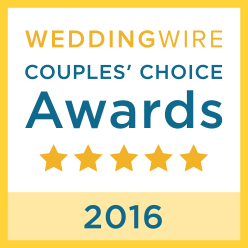 Lucia has performed outdoor weddings on the Beach as well as popular New Jersey Caterers. The Freelance Wedding Harpist As a freelance harpist, Lucia has devoted the her professional career in specializing strictly in wedding events. After years of performing in orchestra’s, ensembles and church groups, her forte is in performing as a freelance wedding harpist. Lucia prides herself as a connoisseur of wedding events. She has performed for religious ceremonies, civil ceremonies, beach weddings, cocktail hours, dinners, engagement parties and wedding showers. She has developed a collection of eclectic musical styles to meet the needs of today’s bride. Performing weddings twelve months out of the year, she is able to consult with you in choosing traditional musical selections or exploring a more unique style to meet your individual needs. A Harp You Can Hear Amplification does allow the audience to appreciate the music. However, a sound harpist can also be heard when playing his or her instrument. Many beginner harpists have the presence and beauty of the wedding moment with an expensive instrument and breath taking gown. However, it is the years of experience nestled in the hands which must begin the process of sound. Without quality of sound produced from these hands, the amplification process becomes meaningless. A bride is entitled to hear the music she has paid for and this only comes with experience. Harp Attire It is traditional for a musician to wear solid black or black/white when performing for a wedding event. Booking a Harpist If you choose to use the harp for your special day, Lucia will be happy to secure the date by mailing an agreement to your home. Clients are requested to return the signed agreement with a deposit within fifteen days of receiving the material. When the time arrives to select your wedding music, Lucia will meet with you in person at her home studio or you may choose your selections during a phone consultation. A music suggestion sheet is available upon request. You will be contacted one week prior to the event to review the details of your special day. Bio Lucia began playing the harp at age fourteen. Lucia believes that in order to be a sound performer, you need to be a life long learner. She continues to attend, participate and present at musical conventions. As a classical performer, she has studied solo pieces as well as eight years of orchestra work. She has also performed with numerous ensembles which include voice, flute, cello, trumpet and violin. She has taught harp and conducted varies harp ensembles throughout Southern New Jersey. Lucia was the premier harpist for seven years at Trump Taj Mahal Casino. During her casino career, she provided harp music for private guests of the hotel which included Donald Trump, Barry Manilow, Yanni, etc…. She was also a harpist for a five star restaurant in Historic Cape May for three years. Today, she enjoys a successful career as a freelance harpist focusing primarily on weddings and special events. Feel free to contact this South Jersey Harpist with any questions about your special event.